I hate STEM toys. I have three kids and ultimately every “educational” toy they’ve used – from LittleBits to Nintendo Labo – has ended up in a corner somewhere, ignored for more exciting fare. This happens for a few reasons but the primary one is that the toys require too much attention and have no lasting play value. Given this fact, I thought our species (or at least my kids) would be doomed to Idiocracy-style techno illiteracy. Luckily, a set of toys from the optimistically-named organization Tech Will Save Us, has changed my mind. TWSU toys are nice in that they are at once rugged toys that withstand constant play and electronic devices that can be programmed by a clever eight year old. For example, the $60 Creative Coder is basically a LilyPad device with a USB interface and a block-based programming language that lets you program it. The TWSU website features a number of little programs you can upload to the board including a Pokemon sensor that starts out red and white until you shake the board, activating the sensor and causing the lights to blink. My son loved it and he slept in it, strapping the wearable to his wrist like an Apple Watch. Programming the Creative Coder is very simple. 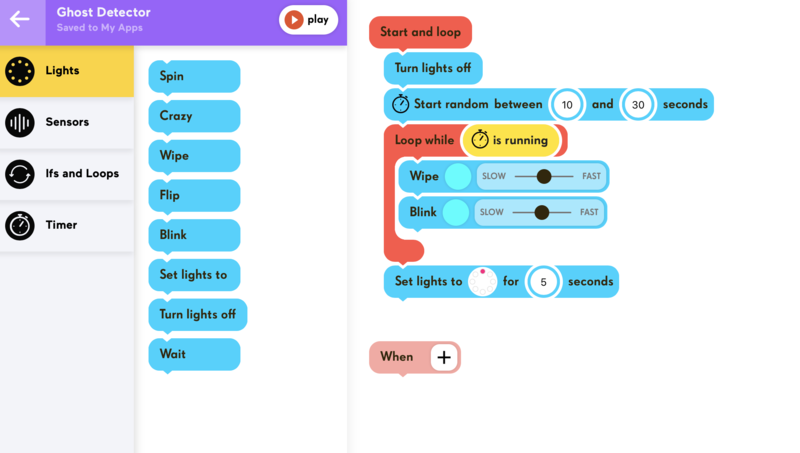 It uses a Scratch -like interface to set colors and activate timers and in a few minutes I was able to make a Ghost Detector that “hunted” for ghosts and then blinked when it found one. I based the idea on an old toy I had in the 1980s called IAN that beeped when it got close to “invisible aliens.” I still remember the excitement I felt walking around in my Grandma’s basement looking for monsters. I think he felt the same excitement. The other toys – including a simple game machine that uses an Arduino and a 9×9 LED display – were similarly interesting. The game machine, for example, included a primitive version of Flappy Bird that my son played for hours and he was excited to get the LED to spell his name on command. It did, however, require knowledge of Arduino programming which limited the usability. However, because it comes preloaded with a simple game the device felt complete right out of the box. How are these toys different from all the other STEM junk I’ve tried? Again, they worked out of the box. The Creative Coder could double as a bike light as soon as you assembled it and it came inside of a plastic case that made it a wearable instead of a science project. The other toys were just that – toys – and the programming was an afterthought. Ultimately I’m sure this stuff will end up under the couch, dead and forgotten, but until that happens they’ve supplied a great deal of fun. STEM toys often focus on the STEM. I suspect this is because engineers are building them and not toymakers. Further, toymakers create things like the Zoomer Playful Pup (another clever toy) and hide all of the technology deep behind layers of plastic. Finding the right balance in so-called STEM toys is incredibly difficult but its doable and, as Tech Will Save Us have proved, these toys don’t have to be too boring or too complex for the kids (and parents) who might buy them.